I’m not a big Halloween fan, I’m normally hiding with the lights off pretending I’m not home when Trick or Treaters come knocking. This year I bought a few oozing eyes from Poundland but I’m hoping no-one comes so I can eat them all myself. I might be tempted to host a children’s Halloween party if I could give tinned fear away instead of party bags though. 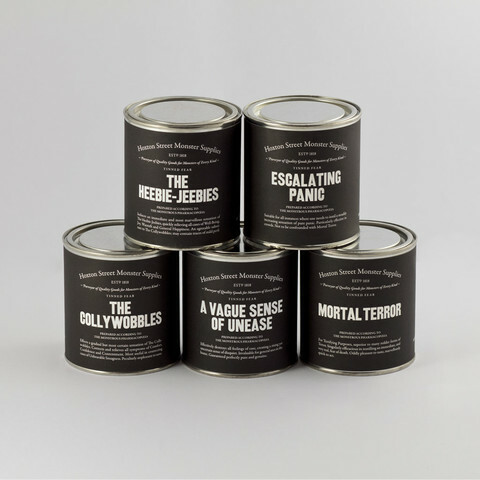 The tins contain sweets and children’s’ stories by bestselling authors. Both versions are £35 for a set of five or £8 each from Hoxton Street Monster Supplies. I also love the Salt Made From Tears range.